Scarification is the practice of permanently marking the skin by cutting it, and is widely practised in Africa. The main purpose of African scarification is to enhance a person’s beauty, but scars can also indicate bravery, show group identity, or mark stages in a person’s life. Collecting African Tribal Art through masks, and headdresses is an easy way to examine the cultural differences, and norms of African Tribes. The Makonde used body scarification in an effort to prevent their abduction into slavery. Although not as popular as before, scarification still finds a place in the culture, and craft of the tribe. A typical Lipico mask is worn on the top of the head partially covering the face and slanted up to enable the masquerader to see through the mouth area. These masks are used in initiation and circumcision ceremonies for boys as they move from adolescence to manhood. The masks may exhibit scarification, which is reflected in thick, symmetrical zigzag patterns across the face area. Consider the marks on the Baule mask. 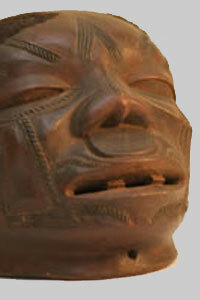 The Senufo use three scars radiating from the edge of the mouth along the side of the face. 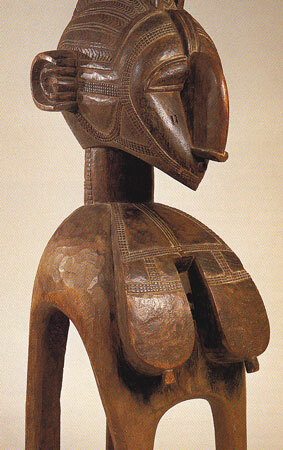 The Senufo however are close neighbors of the Baule in the Ivory Coast. Prehaps the least utilized asset of man is his imagination. The ability to think beyond the box and connect the dots in ways not solely dependent on his own physical means. The myth of Hercules reinforces the concept that even if faced with seemingly impossible odds one may use ingenuity, skill, and luck to fashion a solution. I’ll be the first to admit that I’m no Hercules, but in acquiring a Baga N’mba I feel as lucky as Hercules did in collecting the apples of the Hesperides. The most important of the Baga art forms is the great mask, D’mba or Nimba. It represents the mother of fertility, protector of pregnant women, and presides over all agricultural ceremonies. The dancer, wearing a full raffia costume, carries the mask on his shoulders, looking out through holes between the breasts. In use, such masks rise more than eight feet above the ground; they often weigh more than eighty pounds. Most show a standardized pattern of facial scarification. 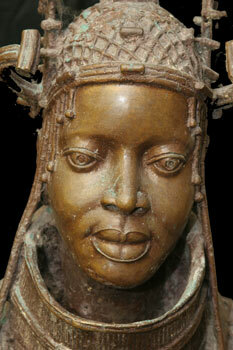 The Baga Nimba, or D’mba, represents the abstraction of an ideal of the female role in society. The Nimba is essentailly viewed as the vision of woman at her zenith of power, beauty, and affective presence; rather than a goddess or spirit. 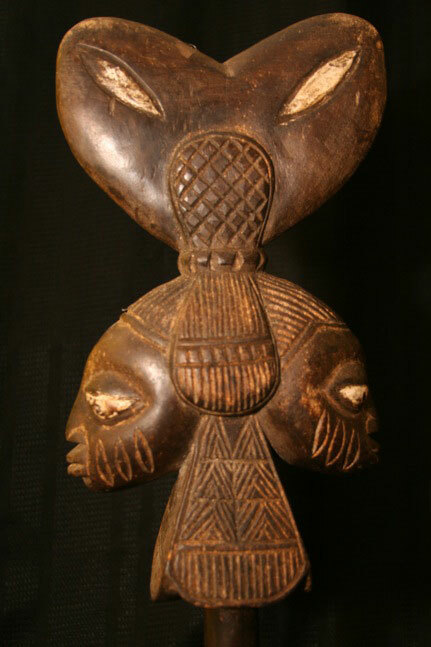 The typical Nimba form illustrates a woman that has been fertile, given birth to several children, and nurtured them to adulthood. Michael Vick is no pretender, in the sense that he would love to lead his team this Sunday against the Jacksonville Jaguars. He is no pretender because he didn’t turn this situation into a Quarterback controversy, simply because there is no controversy. He has paid his dues, he is still one of the most athletically gifted QBs to ever play the game, and perhaps with a little more patience and hard work his story will be one that rivals the most Rudyesque of football movies. While some may question the coach’s motives to pursue the harder path of benching MV, especially in light of his last two performances, the fact is that the Eagles organization have done a wonderful job in providing an environment where this young man can learn, improve his passing game, and be protected from the demons which no doubt assail him. In a society where faster is better , Coach Andy Reid has effectively slowed the circus down, and placed some of the load squarely on his own back. Coach Reid has shown that there are always options, there are always alternatives, and sometimes if one takes a little time and effort, one may find a win-win scenario. The American youth has no shortage of heroes and heroines to look toward… many, especially the brave youth who fall on the field of battle are unheralded. Where we typically fall short, is in our guidance of our youth, and in the effort we should make to disseminate these opportunities, and teach them real world values, norms, and intangible concepts like honor, the value of a promise, and of course commitment. I am often reminded of being taught to cross the road. Instructions (look left, right, and left) would not have been half as productive as having someone hold my hand and walk me through the process. Like our children, the MV story is a work in progress. There are many parallels we can take and use in our own lives, our careers, and our relationships. Disappointments, and setbacks need not be permanent life fixtures. So what if MV has to ride the bench… keep those leotards bright, and shiny… I bet deep down he’s just happy for a chance at continued redemption, and an opportunity to play the game he loves. The Chokwe Tribe of the Congo, stand out as one which maintained their cultural identity by proactively adapting to outside influences, and developing a deeply stylistic approach to their African Tribal art and craft. As in the case of other African peoples, the Chokwe’s success and survival resulted from their cultural flexibility and ability to adapt to impending change. Museum of Fine Arts, Boston - "Art of the Senses - African Masterpieces from the Teel Collection"
The Chokwe artwork incorporates many sculptural figures and masks evoking the memories of their founders and cultural heroes. This idealized image of a chief (or mwanangana, “lord of the land”) is among the masterpieces created by Chokwe artists of the Moxico region, which flourished in the nineteenth century. For Michael Vick there may be movies, documentaries, articles, and books. His story is still being written and many hope for a remarkable ending, one in which his work extends off the field, and one where youth of all walks of life can find some inspiration, a humble attitude, and a deep reservoir of courage. On the question of “Respecting Women”, I came across a figure (at the Brooklyn Museum exhibit), which “epitomized the sensibility of Luba carvers when rendering the image of a woman”. The female figure holding her breasts is the most common motif in Luba art. The gesture has multiple levels of meaning, symbolizing respect,nurturing, and the role of women as mothers. The representation of a woman is also significant since the Luba trace descent through the female line. The female figure additionally references the belief that women hold secrets, especially the secrets of male kings and chiefs, within their breasts. The other figure, displayed at the National Museum of African Art in Washington displays similar characteristics. In buying or collecting African Tribal art and researching the associated histories one may find differences due to the fact that tribes may be nomadic rather than settled, or follow patrilineal, matrilineal, or cognatic descent principles. My questions are fairly simple. How did we move from Tribal societies which lavish respect and adoration on our women, to a modern society which brazenly denigrates our women on a regular basis in the most popular vocal art-forms of Rap and Hip-Hop? Why do we languish in destructive social patterns without taking responsibility for finding ways to protect and instruct young children in social norms which sustain our family units?